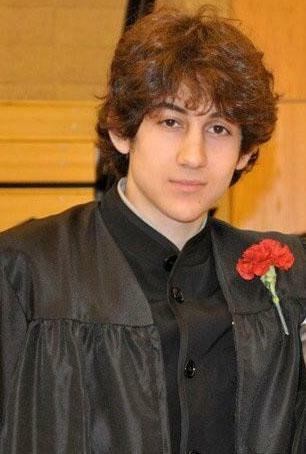 Dzhokhar A. Tsarnaev posed for a photo after graduating from Cambridge Rindge and Latin High School. In a public high school that prides itself on its diversity, “he got along with all the different groups on the team,” Payack said. “We never saw his mother or father and never saw his brother,” Payack said. “He just came back to wrestle with us in February. I mean, he said, he went to UMass and he was studying some sort of engineering and he came back and wrestled, and he was joking with everyone. “I looked up to Dzhokhar because he won states his second year. Seeing this, it’s like seeing one of your heroes and finding a flaw in one of them,” he said. Essah Chisholm, 17, a senior at Rindge and member of the wrestling team, said the coaches would tell funny stories about how people would mispronounce Dzhokhar name’s. But Tsarnaev hadn’t been to the Wai Kru Mixed Martial Arts center in years, instead going to another nearby boxing gym. Until this month. Allan, who is currently traveling in Thailand, got an e-mail within the past week saying Tsarnaev showed up at the gym acting rude and disrespectful, using other people’s equipment, walking on the mats with his shoes. “It was a clear indication that something was up,” Allan said, noting that Tsarnaev hadn’t even been to his gym before the incident in years. “He was becoming a complete [expletive]. “It was completely out of place of place for him,” said Allan, who was also contacted by the FBI about Tamerlan. In the photo essay, called “Will Box for Passport,” Tamerlan stops to answer a phone call while walking from his Mercedes to the martial arts center. He has a long wool scarf wrapped fashionably around his neck and gleaming white leather slip-on shoes and is carrying an Oceanfly dufflebag.